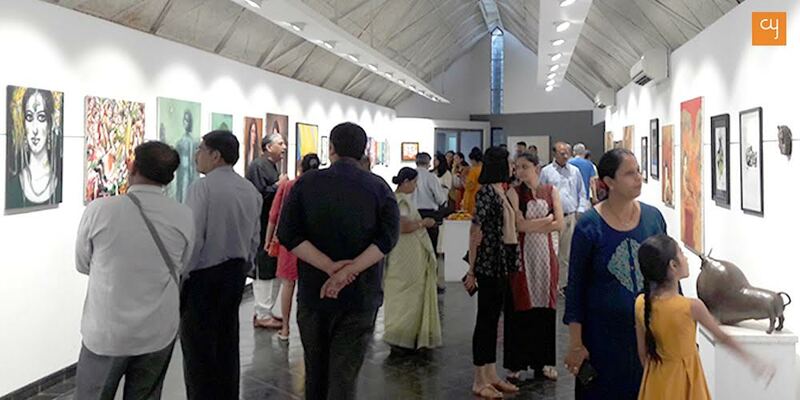 Art group The Artisan of Kolkata is back with its fourth season in Ahmedabad. 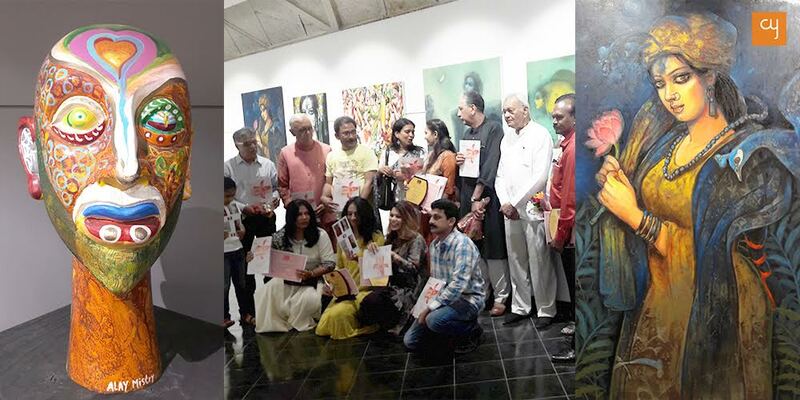 Having earlier showed up under and as Summer Strokes in 2016 and 2017, The Artisan had returned with the works of artists it represents mainly from Kolkata, evolving as Raag Basant in March of 2018, then appearing at The Satya Art Gallery. The current Group Show now comes styled as the second season of Raag Basant in Ahmedabad (Third season with the same nomenclature in its all India count) and features some two dozen artists of standing and repute, also picking up six from Ahmedabad. The show offers a variety of sprightly colours of nature and human romance to go with the mood of Basant, the spring, even as it is already coming to its end with summer setting in rather harshly. 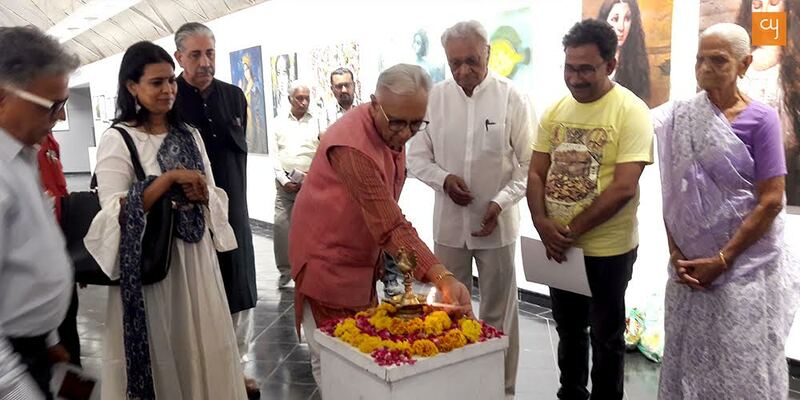 Curated by Susant Das, who has by now struck several alliances and friendships in Ahmedabad and made the shows, joint enterprises with Amdavadi artists and friends helping him on all counts, this show was opened jointly by artists Surendra Patel, Natubhai Parekh, Ruby Jagrut, Vijay Shah, author Arun Kaul, mother of late Mahendra Kadia, whose memory the show was dedicated to, and by Manhar Kapadia who also played host for the proceedings. To extend on this commemoration, the highlight of the show was an on-the-spot portrait of the grand lady done by Vijay Shah. To start with Ahmedabad artists would be a start with the deity of auspiciousness, Lord Ganesha who is the subject matter of the Rhythm of Life series put up by the self-made artist Hemali Amin. Amin has visualized Ganesha’s positive influence in human life as that of the one who sets and keeps its pace akin to the notes of the musical instruments of the taal, the string and the wind variety that keep getting richer and lighter with every phase as the life progresses. Rajesh Baraiya has showcased his works Colour of Waves, which are seascapes done in enticing waves of colours! The works are an interplay of the high waves, the horizon and the ships making their way through stormy conditions and succeed in capturing the viewer’s attention instantly for the conflict and struggle underway. Monali Patel has a lone work on display and yet she scores with her play on the twilight zone as she captures the Sunset with Light, another work in the class of a seascape. Alay Mistry makes a departure in form by showcasing four of his painted sculptures that come out of a tedious four-stage process of sculpting, re-sculpting and painting and end up as human faces showing a variety of emotions. Sonal Odedra’s untitled work is an offering in obeisance to Lord Shiva supposedly in the vicinity of the high mountain of Kailash and the holy lake of Mansarovar. The young Bhagyashree has made the most of the opportunity by showcasing the highest number of works amongst all the artists even as her penchant to paint the national bird The Peacock is visibly striking! Her superb engagement with birds and thereby nature in many settings livens up the show and lends to its overall mood. Of the artists on display from the Bengal school, and there is a good number of them from young to the veterans, they all capture the beholder’s attention for their class, illusory metaphor or playful romance in keeping with the tone and timing of the show. While Manoj Mitra draws on the Nayikas of Tagore like Krishnakali and Chitrangada, Subrata Chowdhury indulges with the Fairy Tales. That tryst with the feminine form and emotions goes on with Suhas Roy, Sekhar Kar, Prasenjit Sengupta, Sukanta Das and Ranjit Sarkar, all of whom indulge with moods like abandon and playfulness in Dandiya to the somberness of what may be the Virahini and further on to the meditativeness of a Baul singer! Subrata Das offers the romance of the flute in wilderness via his soft-hued half bare men who pass as shepherds; and Sukanta also doubles up with his focus on Krishna’s romance in the similar vein. All these works draw you close for a savouring and devouring of the definitiveness of forms, speaking emotions and the right mix of colours in oil or acrylics! Veterans Rabin Mondal and Jogen Chowdhury are present with profiles under titles like The Face and Face Looking up. Shuvaprassana’s work in mixed media titled The Illusion is, of course, illusory in its content even as his series by the same name in actually known for divinities and studies in flowers. Shyamal Mukherjee stands out for his works in Babu-Bibi series, a line very popular with many other Kolkata artists too which shows couples or couples with their families. Shyamal seems to have improvised in his treatment of the couples’ mannerisms, given them a stylized look and some shiny colours. Susant Das himself is part of the show with just one work or so, an untitled landscape in oil. As for the commercial success of his three earlier ventures in Ahmedabad, Susant the curator says there is not much to share even as The Artisan continues to value the love for art here and would keep returning to cherish the alliances formed in the town. The show of fifty odd works is on till Sunday, April 14 at The Gallery in Amdavad ni Gufa and is surely worth a look.